Stand back people, I'm about to rant. 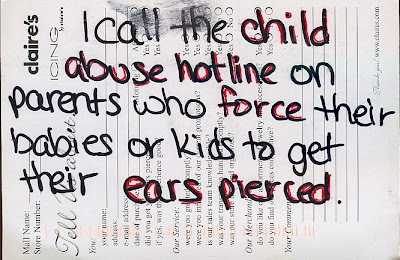 This was posted to www.postsecret.com, which I follow, highly recommend and read weekly. 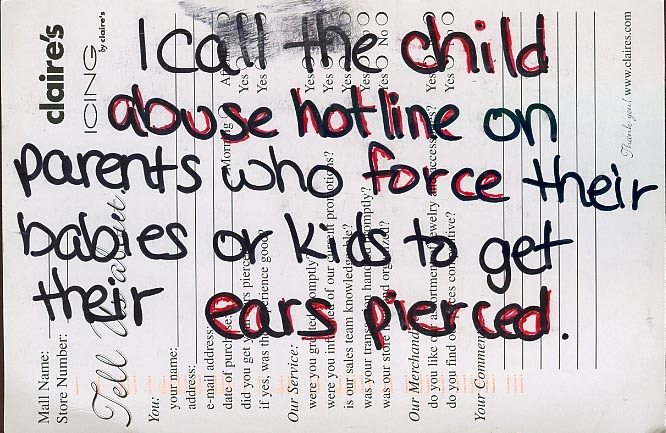 The post card here says "I call the child abuse hotline on parents who force their babies or kids to get their ears pierced." Strikes me wrong and I'll tell you why. I'm not going to argue that it is morally wrong to get a child's ears pierced against that child's will. For my own children, I let them get old enough to request getting their ears pierced and then I made them wait a little while longer until they can prove they can handle the responsibility. That being said, I'm not usually going to tell someone else how to raise their kids or that they should not get their kids ears pierced at whatever age. If you do this, if you call the police on parents who pierce their kid's ears, you've just wasted someone's precious time when they could have been helping children that actually needed it. Actual abuse victims. First off, what you don't know about social workers and child abuse investigators is that they are required by law to investigate every single case to it's fullest extent. That may sound noble and what you'd want to happen in our society, but there are a limited amount of people who do this kind of work and a limited amount of time they have each day. Pierced ears are not a priority. Neither are a lot of things that come across their desks. Here's a fun fictional example. Susie Homebody is driving home from the store one day and sees a small child of maybe three or four walking alone. At first this doesn't grab her attention, but then she notices he is alone with no one watching him. Is he in trouble? Has he wandered off or is there a parent nearby? Not immediately sure what to do, Susie drives home. Okay, just to cover everything, you saw a child walking alone on a street unsupervised? And the street name is ______? Do you know which house he lives at? Did you recognize the boy? Well a little. He was maybe three or four, but maybe older? He had a striped shirt and dark brown hair. And his race was _____? So... what you are saying is that you saw a random unattended kid, whose name you do not know and he may be far from home OR he may have been in his own front yard and well supervised. He was on _____ street, and that's about it besides his description, correct? Yep. So do you think you can help? And they do. They open a case file. A police officer and someone from family services or wherever is assigned. They look into it. They find nothing. No missing children. No other reports of neglected children on that street. No relatable record of ANY child of similar age living on that street. They spend hours or days on it. They find no leads. The case goes nowhere. The end. I'm guessing this happens all the time. Social workers get paid very little for the most part and their successes cannot be shone under a spotlight. Their mistakes --or perceived mistakes-- make the evening news. There are only two major times you hear about them on the sensationalist news, and it is usually regarding a case where it has been determined that a parent's rights to their children could be terminated. On the one hand, you have the street interview with the distraught parent who has just had their parental rights terminated and they are crying innocent in front of their family and cameras. "Why'd they steal mah children away from me? I din't do nothin' wrong!" The social workers look like unfeeling government drones, stealing children in the night. Can they bring out the evidence they've found so far? No, everything is still pending investigation. On the other hand, there are those times when they have investigated or were investigating a family, but a child dies while this is going on, too late to be saved. The news digs up alarming issues that are held up as red flags that any logical person would see and immediately say "Oh, those kids should have been out of that house a long time ago." So, of course they look generally incompetent on the whole. "Wasting the taxpayers money" you might say. And do you know in both situations who actually MAKES the final decision to take children from the home? A judge. Not the social workers. Parental rights can only be terminated by a judge. Yet every time something goes awry, the blame gets aimed at the social workers. Their job is to do the job the rest of us won't or can't do. You may have heard the old saying that it takes a village to raise a child. We aren't that village anymore, but we've appointed these watchdogs to be our village. They keep our friends and neighbors from beating their own children. They keep bad parents from neglecting and abusing their children. They don't do a perfect job, mainly because of the constraints and demands placed upon how, when and where they can do their job. But for the most part, they do their best. Here's how YOU can help. If you see someone getting their baby's ears pierced and you think it's wrong and wish to do something about it, tell that person to their face. If you work at Claires, then refuse to work on children who are too young. But don't call the police. This is not actually defined as abuse, and after a lengthy investigation it will get dropped. If you don't like this, then be the village and help raise that child. Otherwise, don't waste people's time. If you see someone abusing or neglecting their children, call the police.